This super easy dinner is a family favorite! 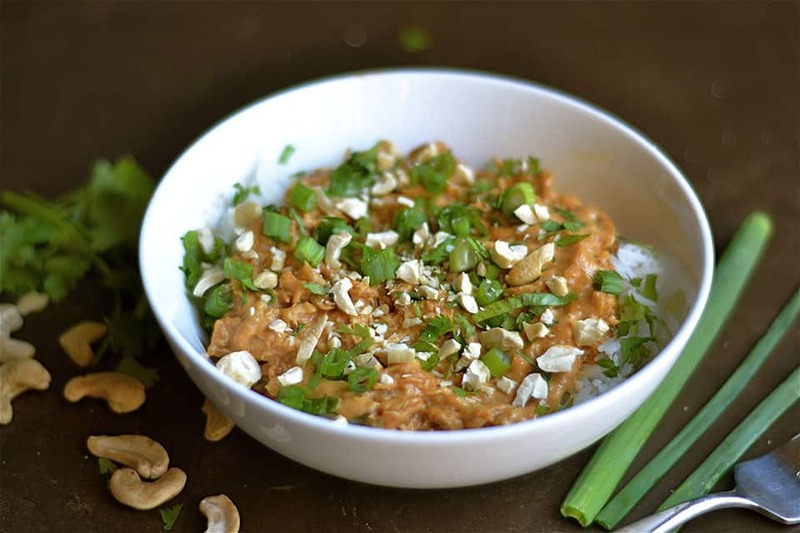 Cashew Butter Chicken has a ton of flavor and is the perfect meal for a busy weeknight that can easily be thrown in the slow cooker or Instant Pot. 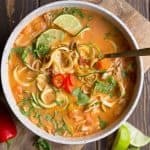 Another busy week in December, and I am reverting back to my tried and true super easy recipes that my kids absolutely devour. December is crazy-town in my house. We have so many activities, holiday parties, and just “life” that is leaving us with little time. Did I mention we’re moving soon? Not too far, just down the street to a house we absolutely love, but nonetheless, the moving prep is only adding to my forever long “to-do” list. Anyhow, sitting down to eat a family dinner is something I make sure we do every night of the week. It’s our favorite time as a family and helps us to de-compress after a busy day. Especially during this busy season! 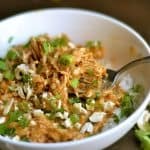 What this mom loves most about the recipe is how I can throw it in my slow cooker with hardly any prep time, and dinner is ready to go when we’re home. Cashew butter, honey, with a salty & slightly Asian kick is a recipe that the entire family can get on board with!! Creamy cashew butter is the star of this simple dish. 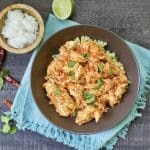 My Slow Cooker Peanut Butter Chicken is one of my most popular recipes, but I always get people to ask if they could substitute for a different nut butter. And the answer is, of course!! So I’ve adapted this version to make it, (dare I even say), even better than the original! This is easy to serve with rice, cauliflower rice, brown rice or quinoa. 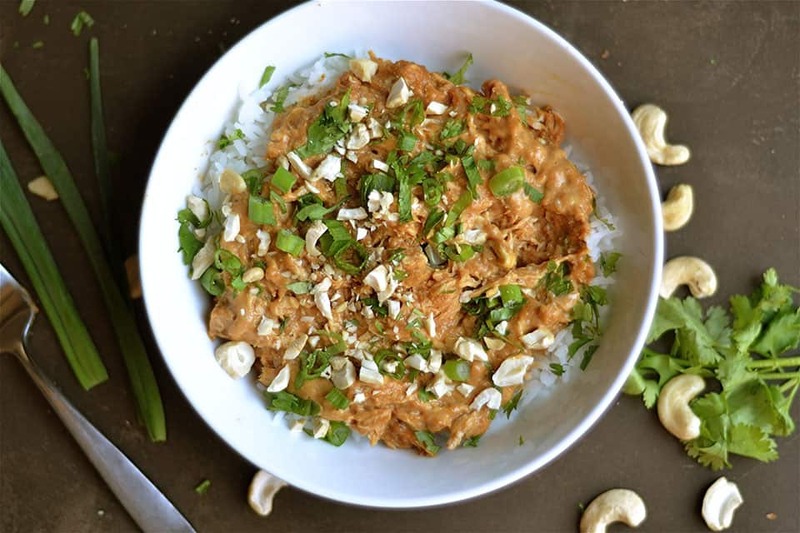 I top with extra cashews, some cilantro, and green onion to give it even more flavor. And the sriracha doesn’t make the dish spicy, but gives it just a little more kick to step it up a notch! I love the tang that works perfectly with the sweet and saltiness of this recipe. Below I’ve given you instructions for both the Instant Pot and Slow Cooker. If you don’t have an Instant Pot, it’s an absolute life saver. I’ve linked you to the one I use and love! 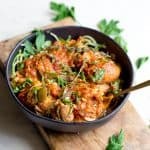 You know those nights when it’s 5pm and you think, “oh shoot, I don’t have anything planned for dinner and it’s too late to use my slow cooker.” Well, the Instant Pot can save you! Most recipes can be made in less than 30 minutes, but with the slow cooker taste. 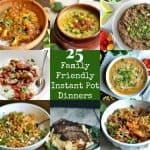 I’ve been contacted by a few readers this week asking me for more Instant Pot ideas, so I’ll be slowly adding instructions for all of my slow cooker recipes with Instant Pot instructions too! 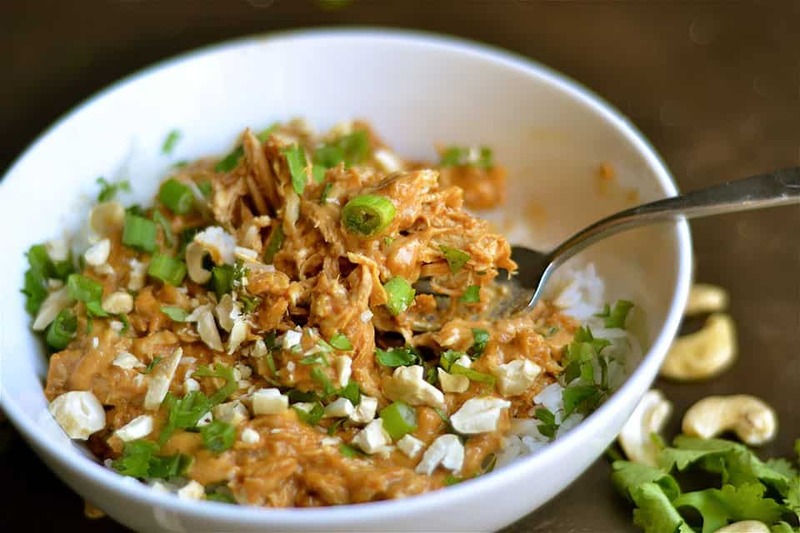 In a small bowl, mix together cashew butter, coconut aminos or soy sauce, honey, rice vinegar, sriracha, chicken broth, and garlic. Mix well to form a sauce. Pour on top of chicken. Cook for 4-5 hours on low, or until chicken can be easily shredded. Add in coconut milk for an additional creamy texture (optional). 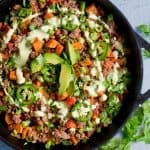 Serve over rice, cauliflower rice, or quinoa. 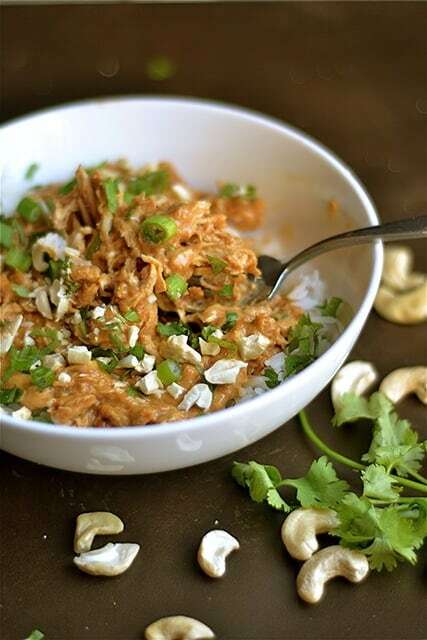 Top with cashews and cilantro for garnish (if using). Cut your chicken into small chunks (about 1-2 inches). Place inside your Instant pot. Secure the lid, and select manual. Cook on high pressure for 7 minutes. Use a quick release. Shred the chicken or keep it in chunks. Stir in coconut milk (if using). Well, my brand new instant pot isn’t pressure cooking! No steam and in 7 minutes the chicken was still raw and bottom of pot was burnt. I followed the directions exactly and tried again. Same results, but chicken seemed cooked. I went ahead and cooked in another pot to make sure temp was correct. The flavors were outstanding! 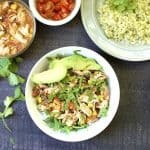 Any hints on this new instant pot user?? I followed the directions above and my instant pot stopped and gave me the “burn” message after only a few minutes. I took everything out and the bottom of the pot had started to burn. I cleaned the bottom and put a little oil in and then put it all back in and got the same “burn” message after 2 minutes. Bottom of my pan was totally burnt. Did I mess something up?? The chicken was already cooked through and it was delicious, just wondering what I did wrong. Thanks for the recipe! I read a few articles that said nuts and nut based sauces are tough in the IP. The sauce is too thick, and in this recipe, there is not enough liquid to adequately steam and pressurize the IP. Hence the burning. I think this is better in the slow cooker, or add more broth to the sauce. Hi Lisa, it might have been with the consistency of your sauce, and next time add in some more broth (about 1/2 cup to be safe). I make this all the time in my IP and only had a problem one time. It was when I didn’t measure my ingredients and just eyeballed it. I didn’t have enough liquid. Glad you still liked the flavor! You could also use some coconut milk in place of broth and it would be delicious. Thanks! Can’t wait to make this again but with more broth! Super yummy!!! I think 3lbs of chicken would have worked as well. I used 2 1/2. Or maybe add broccoli, pea pods,bean sprouts. I will make this again!!! This was tasty, but the burn notice came on twice on the instant pot. I followed your recipe and settings. And idea why? Thanks! 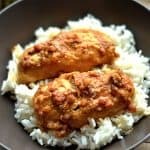 My husband is not able to eat the siracha (no peppers for him), have you ever made this recipe without it? Yes, you can easily omit!! What’s the caloric content of this meal? The recipe has been updated with nutrition facts. They are listed in the notes section of the recipe.